Our group began a new bible study series this past week. 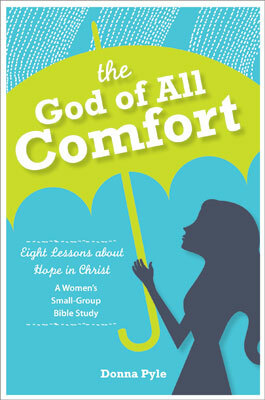 It is called The God of All Comfort by Donna Pyle, if you care to join us you can purchase your book here. It’s not too difficult to catch up and it’s a good study thus far! I will plan to blog about it each Friday that we do the lesson on Monday in class. Now let’s take a look at lesson number one, it was the beginning of something I think will bring me to a place of possible nervousness and push me to go further than I want to. It’s good and it is solid. This particular lesson had some really great things written in it. I am going to list below the ones that caught my and other’s eyes and hearts! Compassion is something we feel. Comfort is something we do. Seriously love this one. It’s epic to me and it needs to be in my eyesight daily! Compassion represents a vital ingredient in establishing relationships. God created us to live together in relationship to provide strength when we are weak, love when we feel unlovable, and comfort when we’re most uncomfortable. This is one that rings true and is full of the best ingredients! Ok now that I have given you a little taste of what this author has to offer, and that was just lesson one, let’s get to the good stuff. THE WORD! Romans 8:15-17 – For the Lord your God is a merciful God. He will not leave you or destroy you or forget the covenant with your fathers that he swore to them. When we are presented with a life changing event and have only a short time to move forward, how do we normally deal with it? Do we turn to the search engine on the internet for answers, call a friend, stop at the store on our drive home to get some retail therapy, gather just the neccesities and basically ignore it, or open our Bible? I can honestly say, I’ve done all of these at one time or another in my life. I’ve longed for comfort in situations but were too uncomfortable to ask for help. I’ve tried to fill my life with material items and searched online for the results. And even on occasion I’ve picked up that trusty Bible and searched for that comfort. I don’t turn to the bible or my friends in Christ enough when I long for comfort. How about you? Is it easy for you to ask for help? Is there a particular book of the Bible you turn to when time of distraught is here? Our need for comfort can be given to us by many things but we know that the one true way to receive the comfort is through our Lord Jesus Christ. Just as God adopted us into his family, we can count on the love, grace, and mercy from Him to get us through. One doesn’t know how God will provide the comfort. It could be from an anomyous person sending a meal or card, someone praying for you, a hug from an aquaintance, or even perhaps the news on TV showing your home is gone from the fire but the swing set is still standing. Although pain and loss hurt for a time, they are light and momentary compared to the eternal glory God is working in us. Normally a person that has suffered loss will give more. We can take our hurt and turn it into a way to empathize with others, comfort others, and show them that God is our eternal life. You can choose to be angry and bitter about a loss, but in reality in what manner does that help you? It doesn’t. Comfort can be found in the daily things of life or the big moments, let’s just open our eyes and hearts to it. Let’s share in what we have experienced and bring forth God’s grace to others. The lesson ended with contentment. Let’s take a look at a couple bible verses that help us focus on contentment. 1 Corinthians 9:8 – And God is able to make all grace abound to you, so that having all sufficiency in all things at all times, you may abound in every good work. Philippians 4:11-12- Not that I am speaking of being in need, for I have learned in whatever situation I am to be content. 12 I know how to be brought low, and I know how to abound. In any and every circumstance, I have learned the secret of facing plenty and hunger, abundance and need. These are only a couple verses that Paul wrote about contentment. It is a work in progress to get our contentment in check, our sinful nature longs for the new electronic gadget, car, boat, or fashion trend. We (me included) should put these verses and bible chapters at the forefront so we can build strength in the area of contentment! God has the power to remove what we think we need to reveal what we truly need. I am recently experiencing this, it’s good, so good my friends! Even if it’s uncomfortable it can be good! Lesson one brings two very important things into play. Comfort, both giving and receiving it and Contentment. I pray that each of us can grow in being able to ask for help, show comfort to others, and be content with what God has provided us with. Gracious Father, today we have examined our comfort and contentment levels. We find that we have failed you and others in some areas and have strength in others, only because of you. We are thankful for the lessons you have given us, the glory to our lives, and we pray for growth within. May we provide others with compassion and comfort, and show them what your true love is about. Thank you for all you have provided to us. Next Memorials Flowers or Both? Nicely done. Good notes on your first chapter. I’m intrigued for sure. I’m not doing this one with you, but will bookmark it so that I can come back when I do get to this study. Relationships! Yes! I have a post that I started about this very thing stemming from Donna Pyle’s other study, the one we’re doing here. So important! I love the diversity in your group – there is nothing more fun than to have such a diverse group of women gathered to study God’s word and pray for one another. I’m excited for you guys. Sounds like a fabulous study. Hello Melody! Thabks for stopping by! Its all good! Just as God is! I LOVE my weekly time with my ladies. It’s a small group, but it’s always a good time. I think every woman who gets a chance to do this SHOULD. Thank you, it’s nice to hear that and give me reassurance! Perhaps you can recommend some you have done to me as well. You can find others I’ve participated in over at my friends blog. Heather @ Dandelions picked. She is a very good writer and blogged some that we did as as group over there. I agree, all ladies should do this! 🙂 Thanks again!